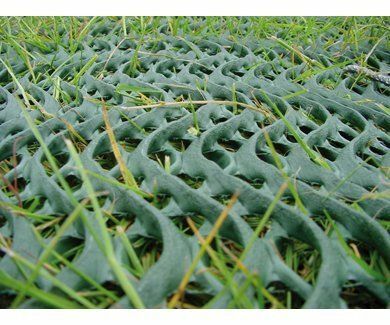 This 660g/sqm Turfprotecta turf reinforcement mesh is a premium grade green plastic mesh for reinforcing grass that gets worn, rutted and muddy from use by occasional cars, other vehicles, pedestrians, bikes, dogs and children in the garden. The plastic mesh is laid onto the the grass that is required to be reinforced, and works by helping to reduce grass wear, rutting and damage by spreading weight and vehicle loads more evenly thus limiting rutting. 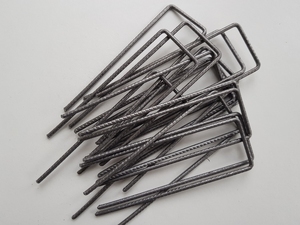 The plastic mesh is fixed to the grass using out steel U-pins. As the grass grows through the holes in the mesh, the roots and grass sward intertwine with the plastic meshes structure producing a strong stabilised natural grass surface where the mesh is nor visible on the surface. The beauty of using TERRAM Turfprotecta grass mesh is that it is a low-cost option that is quickly installed and is ideal for the reinforcement of grass that is used occasionally for cars and light traffic.